On the campus of Virginia Tech, the football stadium dominates the landscape. From Southgate Drive, which winds its way through the Athletic complex, a visitor gazes up at the massive structure — the multi-story edifice, the stands that rise steeply up to the sky, the flags flying from the ramparts — with feelings of awe. On this, the summer solstice, a great quiet surrounds the towering edifice, but one can imagine game days in the fall when tens of thousands of people pass through those forbidding gates and sit in those impressive stands. Unlike the football stadium, the college’s 400m track is not locked up on the first day of summer. A visitor can park a few yards away and stroll through the open gates to the gorgeous 8-lane facility. As he stretches, he might encounter one or two other human beings, a sprinter doing a series of choreographed dynamic drills, a thrower pacing moodily over by the discus cage. As the visitor begins a slow clockwise jog around the track, he feels like he has the place to himself. When traveling to unfamiliar places, figuring out where to run can be a chore. I generally try to come up with a route that doesn’t take me onto main thoroughfares or down narrow country roads with no shoulders or past houses with unleashed dogs. In the back of my mind, I’m always a little worried about local customs, and whether running through certain neighborhoods will elicit anti-runner behaviors from the natives. Normally, I put these worries aside and take my chances. But this last Saturday I found myself in Blacksburg, Virginia for my niece’s wedding and for various reasons, I was hesitant to take my chances with a normal run from the bed and breakfast where many of the guests were staying. For one thing, I felt especially fragile about recent injuries and didn’t want any new challenges, physical or mental. The hilly terrain gave me more than a little pause. Also, just getting back into short runs after having to take time off, I wanted to monitor my run carefully, something I wouldn’t be able to manage if I were too worried about cars, dogs, and people. What I wanted was a track — a standard 400m track where I could run several miles with no distractions. A short time with the satellite view on MapMyRun showed me that there were two tracks in Blacksburg, one at a local high school and the one at Virginia Tech. after considering the relative merits and possible complications, I opted for the track at Virginia Tech, which was a little closer. Honestly, I would have been happy enough with either, or with some old oval that had weeds growing through its cracked surface. I wasn’t there to run fast, just to run a certain number of laps, a certain number of miles. 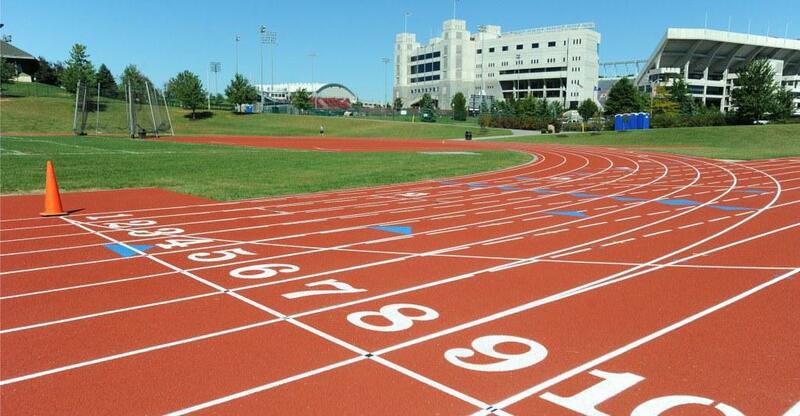 It was a bonus that the VT track had a really nice surface, and broad sweeping turns. After a few laps, I sank into the semi-meditative state of joggers everywhere who plod around and around. As I did so, I considered — not for the first time — how tracks are a public good that we too often take for granted. Tracks get used by all sorts of folks, not just by track teams. In Newton, I live about a mile and a half away from the new Newton North High School, and I frequently head over to the track to run. Sometimes I run there because I want to do a workout or tempo run, but sometimes I run there to include some quiet laps in the middle of an otherwise normal run. In the early winter if we haven’t had much snow, I’ll head over to the track in the evening to run laps under the stars. The funny thing is, no matter when I’m there, day or night, there’s almost always someone else there running or walking or working out. Some people find tracks boring. Or maybe they find the IDEA of tracks boring. Not me. I love the look and feel of tracks, and I love the idea of a place where the distances are measured exactly and there are no obstacles in your way (unless you want them there, in which case, you can easily set up obstacles at carefully calibrated marks). Occasionally I might get annoyed if someone is walking in the first lane, but that’s mostly because I think it’s selfish rather than because it poses any particular problem. It’s easy enough to avoid a walker. And ultimately, their reasons for being there aren’t all that different from your reasons. Anyway, there were no walkers on the track on Saturday. Even the sprinter and the thrower departed shortly after I began to jog. I circled the track out there under the mid-day sun on the longest day of the year and I was alone. Who else would be crazy enough to be out there running at that time of day? I never worried that some one from the college would come by to shoo me away. It wasn’t like I was trespassing on the football field, and I imagined that like tracks everywhere, this one probably got used by joggers throughout the year. No, as far as I was concerned, on that day at that time, the track was there just for me. And I was grateful. Also, at two o[clock in the morning one may find raccoons and squirrels racing around the track.